High Power Density. Easy Processing. New Possibilities. Our industrial production manufactures THEVA Pro-Line high temperature superconductor (HTS) wire. THEVA Pro-Line is characterized by a very high-power density as well as various possible applications. Different kinds of electrical stabilization round its profile. Our THEVA Pro-Line HTS wire is designed for best performance in different applications. 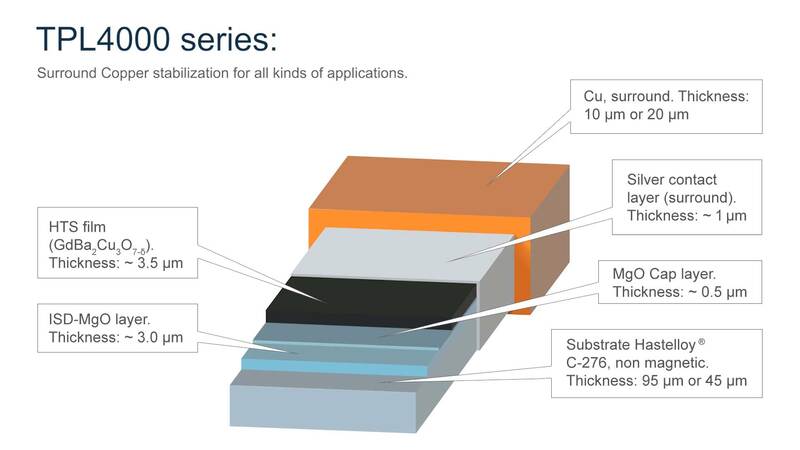 Therefore, we produce our wire layer-wise on a non-magnetic steel substrate. The first layer is an isolating MgO layer which we vaporize via our patented ISD process. A cap layer completes the MgO layer. Both layers preset a crystalline orientation which will be adopted by the following superconductor layer. This orientation improves the crystalline structure and therefore current carrying capacity of the superconductor. Subsequently, a silver layer is vaporized as a contact layer. 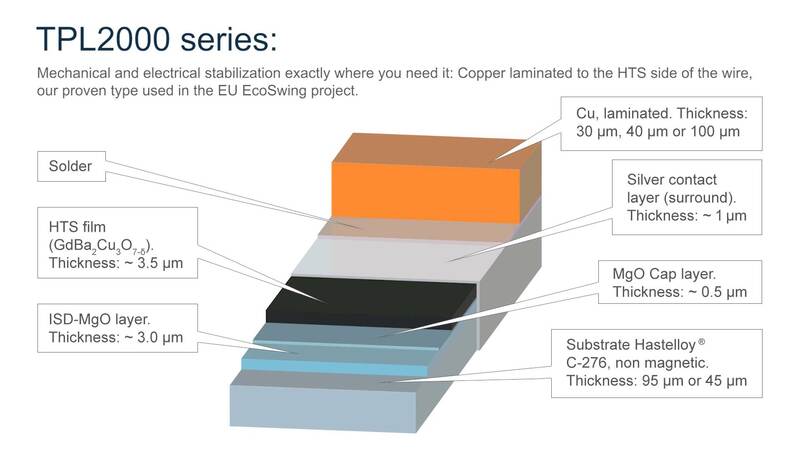 Tailored to the later application of the wire, a copper layer functions as electrical stabilization. The sophisticated design of THEVA Pro-Line HTS wire results in good mechanical and magnetic properties. Small bending radii, high tensile strength as well as an extraordinary performance in magnetic fields characterize the wire. You may find details in the linked datasheets on the right-hand side of this page and our general properties brochure. 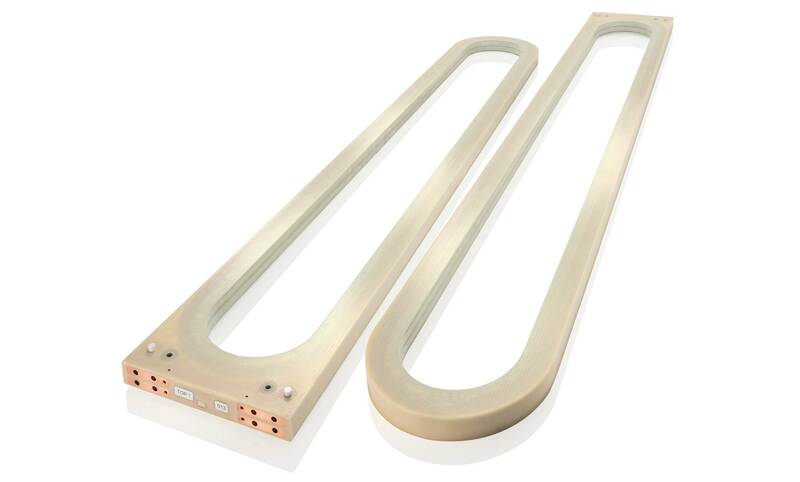 With increasing popularity of superconducting materials in different applications, we built up a profound knowledge base for the use of our HTS wire. If required, we will gladly offer our competent support in your superconductor project and help you find the right partner for the production of your components. Get in touch with us! There are many possible applications for HTS wire. Especially energy and grid topics offer many new topics and utilization areas for superconductivity. On our page applications, you may find several examples for the application of THEVA Pro-Line. You have further ideas or even a project, where you consider using HTS wire? Contact us and we’ll discuss your possibilities! THEVA cooperates with the Israeli company Quantum Experience Ltd., who manufactures and sells superconductor experiment kits and show kitchen sets under the brand name of “Quantum Levitation”. The experiments show the unique physical properties of magnetic levitation of superconducting materials. THEVA Pro-Line HTS wire is used to manufacture the levitators. The sets have been specially developed for use in schools, universities and other educational institutions. THEVA is not only HTS wire manufacturer but cooperates with competent partners to produce high performance coils from the THEVA Pro-Line wire. With this knowhow, we can develop and produce coils of different sizes and performances. The maximum size for coils is currently 1.4 m (4‘7“). Depending on the application, different potting compounds can be used to stabilize the windings and enable efficient cooling. One example for the application of superconducting coils from THEVA is the EU project EcoSwing, where a 3.6 MW wind turbine generator was developed and built. The use of THEVA coils resulted in a lower size and weight of the generator. Further questions about superconducting coils? Contact our sales team! TAPESTAR-Family: Quality Management for Coated Conductors. 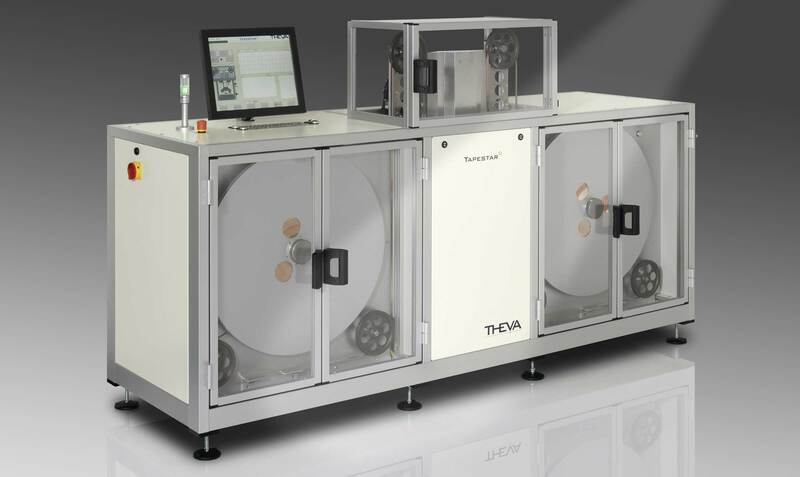 The TAPESTAR™ enables rapid, high-resolution quality inspection for superconducting tape. By means of a non-contact measurement method, the device produces continuous scans of the critical current along the tape with millimeter resolution, also enabling reliable detection of local faults and non-uniformities in the superconducting coating. The measurement method can be used for all types of HTS superconducting tape (1G or 2G) and works independently of their magnetic properties – also for thick laminated or insulated tapes where electrical contact is unavailable. Many laboratories and well-known tape producers rely on this method. The TAPESTAR™ is available in two versions. The TAPESTAR™ XL is suitable for quality control in a production environment or incoming inspection of goods. The smaller version TAPESTAR™ is ideal for lab use. Both versions can be customized for various different tape widths.